New to SwingSetMall.com — Experience the true joy of swinging with a friend! Our new Face-to-Face Glider brings back a classic swing that has been enjoyed by kids from generations past. Framed with sturdy powder-coated steel with molded plastic seats, back and foot rests. 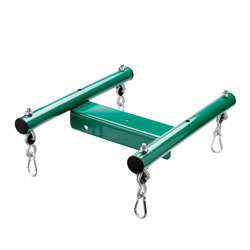 Includes rope with steel rings for attaching to our Glider Brackets and swing beam.